I have been crazy busy these past few days, getting the kitchen ready for Christmas! We have changed oven and cooktop and it’s a brand new world. I’ve been living with an old fashioned oven from ca 1981. With the premium 80’s color of green of course. Really retro, almost fashionable today. However, it takes approximately 2 days to boil a cup of water, so my patience has eventually run out. No, not exactly 2 days, but a really long time, if you must. There was also only 3 zones, which made some types of cooking especially creative. But the kitchen is ready now. And cleaner than it ever has been. So satisfying, but I’m so tired now! The first thing I made on the new stove was this orange hot chocolate. This is my go to hot chocolate + cinnamon and orange zest. So easy! And it feels a little more festive. I usually only make it during Christmas and Easter in order to make it feel more special, and it does. Right when I took a sip I thought of Easter because that’s when I made it last. However, it’s Christmassy right now. I begin with heating 1 cup of whole milk with unsweetened cocoa, sugar and cinnamon in a medium saucepan. While I wait I’m getting the orange zest ready, and putting it in once ready. When it’s beginning to boil and rise in the saucepan, add in the rest of the milk. Heat up until barely boiling. Taste and adjust sweetness and chocolateness as you wish. I often make it a little more bitter because I want to add whipped cream or marshmallows to it. Run it through a fine mesh strainer before you pour it into cups to avoid drinking the zest! I made this to accompany doughnuts. And when I say doughnuts I mean no glazing and only the plain, super delicious and crispy Norwegian doughnut. It is so, so good and I’m always so sad to see those glazed chunky doughnuts in the store. Where is the appreciation of old fashioned doughnuts?! I’m giving it a voice, by giving you the recipe sometime very soon. Trust me. So much better. 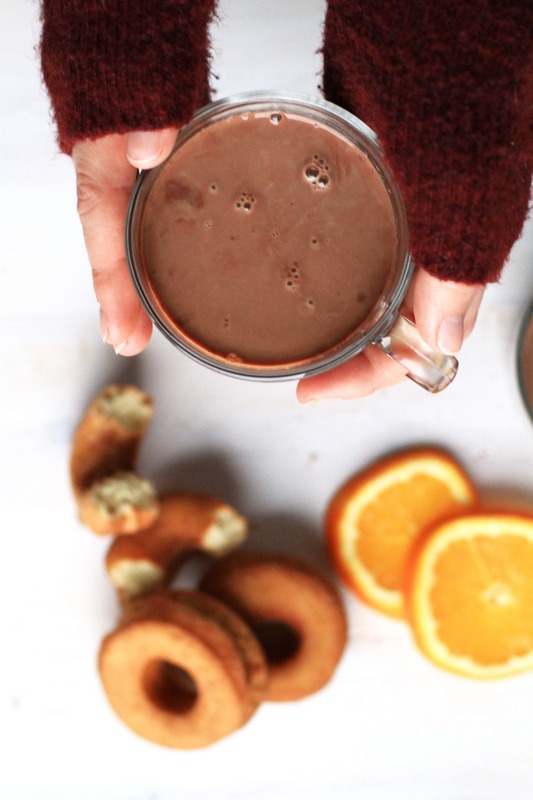 Anyways, give this orange hot chocolate a go, and tell me what you thought of it! Either in the comment section below or tag me @thegingerwithspice on Instagram. And don’t forget to Pin it for later. 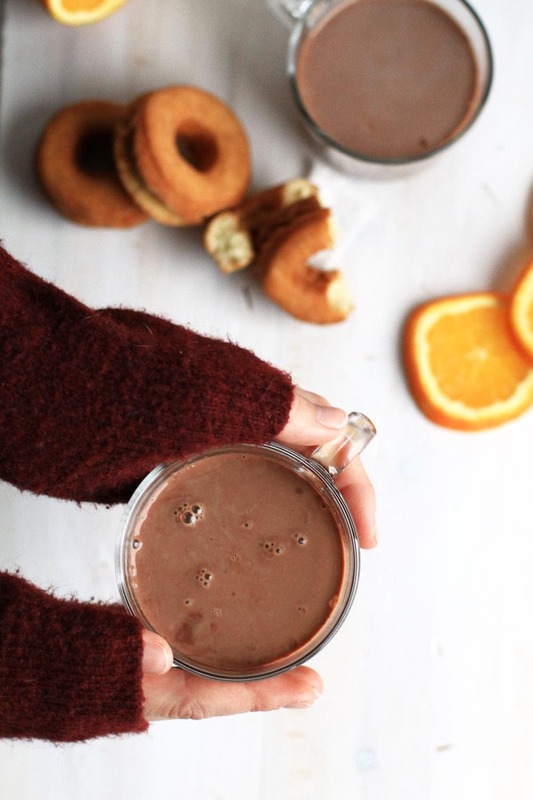 Hot chocolate infused with delicious winter flavors of orange and cinnamon. Perfect to snuggle next to the fireplace on cold winter days. Heat 1 cup of whole milk with unsweetened cocoa, sugar and cinnamon in a medium saucepan. While I wait I'm getting the orange zest ready, and putting it in once ready. When the milk is beginning to boil and rise in the saucepan, add in the rest of the milk. Heat up until barely boiling. Taste and adjust sweetness and chocolateness as you wish. I often make it a little more bitter (more cocoa) because I want to add whipped cream or marshmallows to it. Run it through a sieve before you pour it into cups to avoid drinking the zest!